Our product range includes a wide range of led model-2 industrial emergency light, model-1 industrial emergency led light, led emergency light (model -led-tub_1ft), industrial emergency light - led model_2_exit nikash, industrial led emergency light (model-led_1_woe) and single beam halogen model - industrial emergency light. Industrial Emergency high beam lighting system. Inbuilt Protection for Battery Over Charging, Deep discharge, Overload & Short Circuit. High beam LED Circular Lamps. Models are available with or without EXIT / NIKAS (IN Hindi) sign. Models are also available with Halogen light. Models are also available with Solar charging provision. Light Weight, Can be mounted on Wall / placed on the floor. Powder coated Steel sheet made a durable enclosure. Very economic & also Portable. Packaging Details: Primary Box- 1 Set. Master Box - 3 Sets. Leveraging the vast experience and knowledge of this domain, we are engaged in manufacturing the premium quality of Industrial LED Emergency Light . 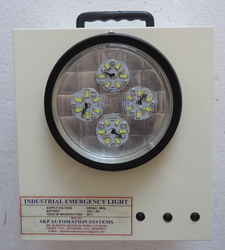 Its energy efficient design and rugged construction, makes this industrial emergency light highly demanded. 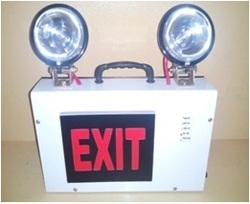 To meet the precise needs of our patrons, we offer the offered industrial emergency light in various specifications. Packaging Details: Primary packing- Corrugated Paper Box. Secondary Packing -- Palletised. 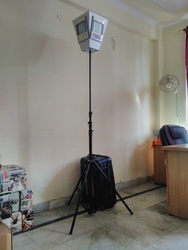 This Emergency light is designed for latest needs of Clean Rooms, Airports, Hospitals, Showrooms, Medical Clinics, Food Industries, Housing Societies/ apartments staircases & other areas where safety & hygine is outmost requiement along with immediate reliable backup lighting solution in case of black out. Technical Spec..1 Battery --- 12V, 4.5 AH SMF. 2 Back up --- 5 ~ 6 Hours(LED). 3 Light type --- 2 X 5 Watt LED Tube. 4 Weight --- 4.0 Kgs. (approx). Salient Features1 Industrial Emergency General lighting system. 2 12V, 4.5 AH Sealed Maintenance Free Battery. 3 Inbuilt Protection for Battery Over Charging, Deep discharge, Overload & Short Circuit. 4 Long Life, High Back up LED Light. 5 Portable & very useful for Maintenance & security needs. 6 Automatic Charge & discharge controlled. 7 Light Weight, Can be mounted on Wall / placed on floor. 8 Powder coated Steel sheet made durable enclosure. 11 Very economic & also Portable. 9 Warrantee -- 12 Months. UsageImmediate, safe & reliable backup lighting solution in case of black out in Clean Rooms, Airports, Hospitals, Showrooms, Medical Clinics, Food Industries, Housing Societies/ apartments staircases etc. Packaging Details: Primary Carton- 1 Set. Master Carton-4 Sets. Body Material Powder Coated Steel Body. This Emergency light is designed for latest needs of Clean Rooms, Industriess, Malls, Housing Societies/ apartments staircases & other areas where safety & hygine is outmost requirement along with immediate reliable backup lighting solution in case of black out. Technical Spec..1 Battery --- 12V, 7.2 AH SMF. 2 Back up --- 5 ~ 6 Hours. 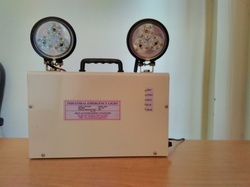 3 Light type --- 2 X 12 Watt LED Beams +4 watt EXIT/NIKASH Display..
4 Weight --- 7.0 Kgs. (approx). 2 12V,7.2 AH Sealed Maintenance Free Battery. 8 Powder coated Steel sheet made durable enclosure. 11 Very economic & also Portable. UsageImmediate, safe & reliable backup lighting solution in case of black out in Industries, Showrooms, Godowns, warehouses, Housing Societies/ apartments staircases etc. Packaging Details: Primary Box-1 Set. Master Box-4 Sets. 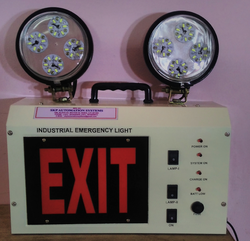 This Emergency light is designed for latest needs of industries. It can be used as backup/safety lighting systems as well as Emergency light. Therefore, it is very useful & durable lighting application. No. of Industries & Institutions are happily using this Product. 1. 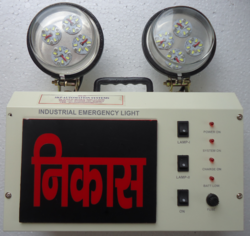 Industrial Emergency high beam lighting system. 2. 12V, 7.2AH Sealed Maintenance Free Battery. 3. Inbuilt Protection for Battery over Charging, Deep discharge, Overload & Short Circuit. 4. Neck angle adjustable (360 Degree horizontal & 180 DegreeVertical). 5. High beam LED Circular Lamps. 6. Models are available with or without EXIT / NIKAS (IN Hindi) sign. 7. Models are also available with Halogen light. 8. Models are also available with Solar charging provision. 9. Light Weight, Can be mounted on Wall / placed on floor. 10. Powder coated Steel sheet made durable enclosure. 11. Very economic, portable & maintenance Free. 12. Warrantee -- 12 Months. 1. Battery --- 12V, 7.2 AH SMF. 2. Back up --- 5 ~ 6 Hour @ full Charge. 3. Light type --- Pure White /Warm White, SMD LED,18 Watts. 4. Size ---- 300mm (L), 90mm (W) and 320mm (H). 5. Weight --- 5.5 Kgs. (approx.). 1. As Normal Lighting application in Shop Floor / Offices / Shops / Residences i.e., for anywhere. 2. As Emergency light in Shop Floor / Offices / Shops / Residences i.e., for anywhere. 3. As uninterrupted Portable light source in Picnic / Kiosks / Servicing works in any remote place. Packaging Details: Primary Carton box contains 1 set. Master Carton box contains 3 sets. Battery 12V, 7 Ah SMF. Warranty 12 Months( Except Bulb & Fuse). 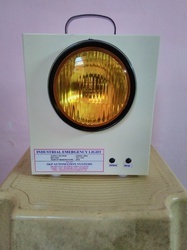 Keeping the track of latest happening in this domain, we manufacture and supply Single Beam Emergency Light. Rendered by us in various sizes and technical specifications, the offered single beam industrial emergency light is appreciated for its less power consumption. 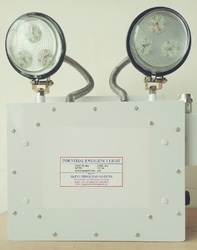 Besides this, the offered single beam industrial emergency light is rendered by us at pocket friendly prices. 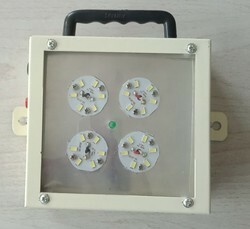 We are the leading manufacturer and supplier of Model -LED-GP-2 LED Emergency Light. It covers a large area with its lights. It is easy to install. We provide the product to our supplier at a reasonable cost with the better product. 3. Light type --- Pure White /Warm White, SMD LED,24 Watts. 4. Size ---- 330mm (L), 140mm (W) and 350mm (H). 5. Weight --- 6.5 Kgs. (approx.). Packaging Details: One Primary Carton contains 1 set. One Master Carton contains 3 sets. 2. 12V, 4.5AH Sealed Maintenance Free Battery. 4. Powder coated Steel sheet made durable enclosure. 6. Very economic, portable & maintenance Free. 10. Warrantee -- 12 Months. 1. Battery --- 12V, 4.5 AH SMF. 2. Back up --- 4~ 5 Hours @ full Charge. 3. Light type --- Pure White /Warm White, 12 Watt SMD LED Asembly. 4. Size ---- 180mm (L), 100mm (W) and 180mm (H). Packaging Details: Primary Box- 1 Set. Master Box - 6 Sets. Back up 4 ~ 5 Hour(LED)@ full Charge. 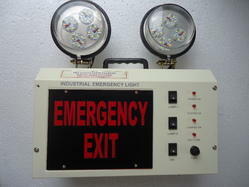 This Emergency light is designed for latest needs of industries. It can be used as back up/safety lighting systems as well as Emergency light.Therefore, it is very useful & durable lighting application. No. of Industries & Institutions are happily using this Product. 1 Industrial Emergency high beam lighting system. 2 12V, 7AH Sealed Maintenance Free Battery. 4. Available in Halogen Model & LED Model. 5. Portable & very useful for Maintenance & security needs. 6. Automatic Charge & discharge controlled. 7. Models available with Inverter Mode. 8 Models are also available with Solar charging provision. 11. Very economic & also Portable. 13. Warrantee -- 12 Months( Except Bulb & Fuse). 1 Battery --- 12V, 7 AH SMF. 2 Back up --- 4 ~ 5 Hour(LED)@ full Charge. 3 Light type---Pure White /Warm White,SMD LED Asm.-21 Watts. Usage1 As Normal Lighting application in Shop Floor / Offices / Shops / Residences i.e., for any where. 2 As Emergency light in Shop Floor / Offices / Shops / Residences i.e., for any where. 3 As uninterrupted Portable light source in Picnic / Kiosks / Servicing works in any remote place. 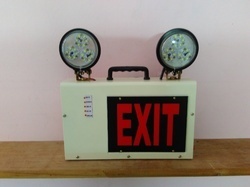 3 Light type --- 2 X 12 Watt LED Beams +4 watt NIKASH Display..
3 Light type --- 2 X 12 Watt LED Beams +4 watt Emergency EXIT Display.. 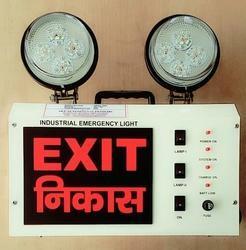 LED Display EXIT / NIKASH in Hindi. 1. Industrial Emergency Flame Proof LED lighting system. 4. Neck angle adjustable (360° horizontal & 180°Vertical). 7. Can be mounted on Wall / placed on floor. 8. Powder coated heavy Aluminium made durable enclosure. 9. Warrantee -- 12 Months. 2. Backup --- 5 ~ 6 Hour @ full Charge. 4. Size ---- 350mm (L), 140mm (W) and 410mm (H). -- (approx.). 5. Weight --- 9 Kgs. (approx.). Packaging Details: Reinforced Corrugated Box. Valued and appreciated as a reliable manufacturer and supplier, we offer the finest quality of Industrial Emergency Tubular Light - 2 Feet. Manufactured as per the industry laid norms, the offered industrial emergency tubular light is known for its contemporary design and less power consumption. To meet the precise needs of our patrons, we offer the industrial emergency tubular light in various specifications. Highly recognized for its quality, our enterprise is affianced in offering an enormous collection of High Mast Foldable & Portable Emergency Light. The offered Inflatable Emergency Lights are made with high-grade material and modern machinery employing with the predefined standard. Further, we are giving modified facility according to detail given by our patrons on a given time-frame. Powered by Honda Portable Petrol Generator. Can also work on AC220 / 240V mains. Can be easily used in Rainy condition. 1. All Purpose, high bright, long back up Emergency lighting system. 2. Sealed Maintenance Free Battery. 3. Wall / Ceiling mountable, ideal for Lift as back up light. 4. Portable & very useful for Maintenance, security needs or any other emergency/general lighting requirements. 5. Super bright & long life SMD LED Lamps. 6. Automatically switches on In case of main Power failure & switchs off on Power resumption. 7. Models are also available with Solar charging provision. 8. Powder coated, steel sheet made durable enclosure. 9. Warrantee -- 6 Months. 2. Wattage – 12 Watt SMD LED. 4. Backup --- 3~ 4 Hour @ full Charge. 5. Size ---- 170mm (L), 130mm (W) and 80mm (H). 6. Weight --- 1.5 Kgs. (approx.). Back up 0.5 ~ 1.0Hour @ full Charge of battery. 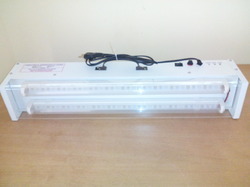 Wattage 2 X 35 Watt, Halogen or 2 X 20 Watt, Halogen. 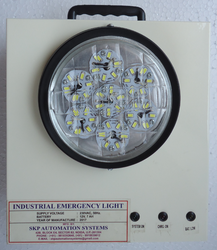 As a noteworthy entity of this domain, we manufacture and supply the finest quality of Halogen Emergency Light . To develop the offered industrial emergency halogen light in various sizes, we make use of latest technology. The quality of the offered industrial emergency halogen light is the ever compromised at our end. 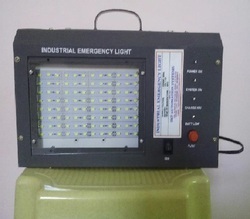 This Light is an important support in an emergency need or any Disaster management need. Since it's set up time is extremely low, and lightweight & does not require maintenance, it is very popular for its application. Small, lightweight, foldable and portable. Can be operated easily by one person. It is safe and reliable. 200Wat LED Hi glow Light to illuminate an area of 10,000 Sq.ft. app. Rechargeable from AC220/240V Power Supply. Standalone glare free illumination system. Can be used both indoor as well as outdoor. In any Disaster Management activities. In any maintenance work in remote place. 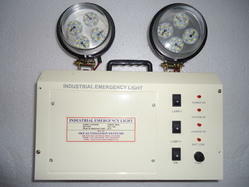 Looking for Industrial Emergency Lights ?